When it comes to Indian Head penny key dates, rarities, and varieties, a small difference on a coin can result in a large difference in the value. Listed below are the key dates and varieties for the Indian Head cents that were minted from 1859 to 1909. Read the descriptions carefully and study the photos to see if your Indian Head penny is worth more than you think. In 1859, when Indian Head cents were first made, they were composed of 88 percent copper and 12 percent nickel. In 1864, the U.S. Mint stopped using nickel in the production of Indian Head pennies and changed to a bronze composition, consisting of 95 percent copper and 5 percent tin and zinc. Over 13 million 1864 dated pennies were minted using the copper and nickel composition. Over 39 million 1864 dated coins were made with the bronze composition. The copper and nickel coins have a slightly silver-ish color to them, while the bronze coins have a deeper orange color. Circulated bronze coins have a brown patina to them, and the copper nickel coins retain some of their silver color. The 1864 Indian Head penny that contained the copper nickel alloys sells for about a 30 premium premium over the bronze alloy. 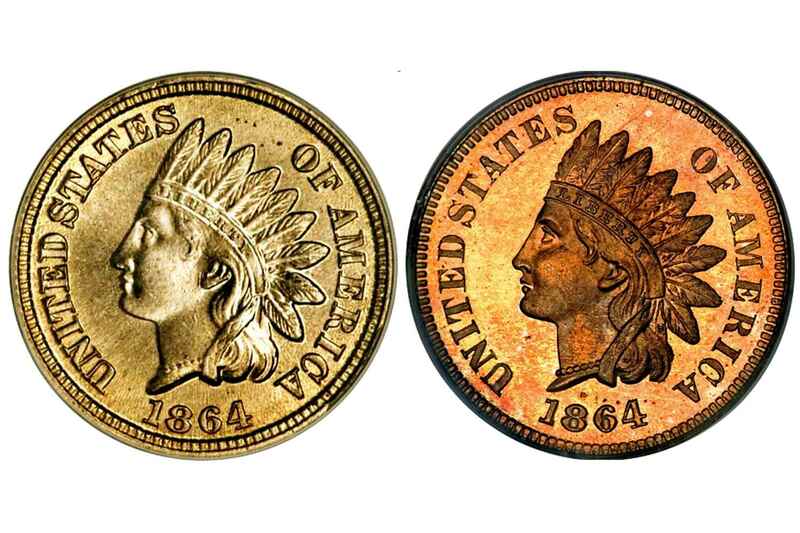 There are two varieties of the bronze 1864 Indian Head penny. The first has a plain ribbon tail behind the neck where the headband meets the curls of hair. Another indicator for this variety is that the tip of the bust is more rounded than on the variety with the "L". This is the more common variety of the 1864 Indian Head penny. Therefore, it sells at a lower price than the variety with the "L" on the ribbon next to the last tail feather. Later in 1864, an "L" was added to the ribbon, resulting in another variety of the 1864 Indian Head penny. The small "L" is located on the ribbon behind the neck where the headband meets the curls of hair. This "L" is designer James B. Longacre's last initial. You can also look at the tip of the bust, which is more pointed on this variety than the variety without the "L" on the ribbon. This variety of the 1864 Indian Head penny normally sells for almost 4 times as much as the one without the "L" on the ribbon. Pay close attention to fakes and forgeries that may be out there. When buying higher quality coins, make sure you buy from a reputable coin dealer and that they have been certified by a third party grading service. While producing the dies for the 1869 Indian Head cent, a production problem occurred that resulted in a doubled die. The doubling is most noticeable on the last two digits of the date, "69." Look above the two numerals for a shadow of the two numbers. While engraving the date on the die at the mint, two different varieties of the "3" were used. The first variety has a "3" in the date that is more open, as indicated by the distance between the ends of the loops in the numeral. The second variety of the 1873 dated Indian Head penny has a "3" in the date that is more closed when compared to the open "3" variety as illustrated above. Another production error in 1873 resulted in a doubled die variety. 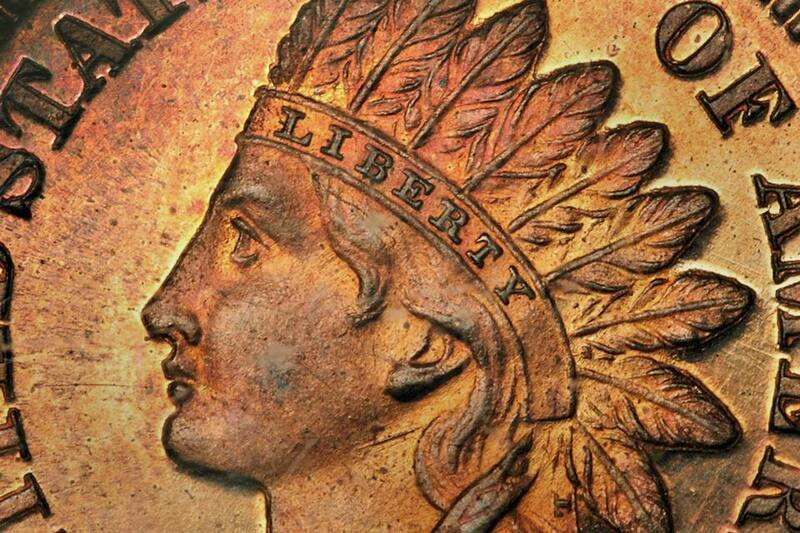 This is most noticeable on the word "LIBERTY" on the headband. Doubling can also be seen on the hairline and the eye. This variety is valuable in any grade. Although not an error or variety, the 1877 Indian Head cent had an extremely low mintage of only 852,500 coins. This has made it a key date and one of the most valuable coins in the series. A change in production in 1886 resulted in two different types of Indian Head cents being produced. The first one, known as "Type I," has the last letter in the word "AMERICA" aligning with the lower curl on the Indian's bust. The second variety of 1886 Indian Head cents has the last letter in the word "AMERICA" aligning more to the right of the lower curl on the Indian's bust. Although somewhat controversial, it is believed that an 1887 Indian Head cent hub was reused to produce the 1888 Indian Head cents. The lower part of the last numeral in the date can still be seen sticking out from the lower left corner of the "8." This is the rarest and one of the most valuable Indian Head penny varieties found so far. Be cautious of unscrupulous coin doctors that have added a small lump to the bottom of the last "8" in the date. In 1909, the Lincoln cent design replaced the Indian Head penny, but not until almost 300,000 Indian Head cents were produced at the San Francisco mint. This extremely low mintage makes this another key for the Indian Head cent series.